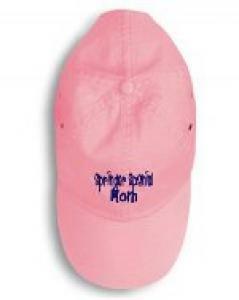 This pink baseball cap is 100% cotton with a matching-color sweatband within the cap. Two metal grommets are on side panels. Cap bill has four row stitching - fabric hideaway closure with brass buckle and brass grommet closure. Do not dry clean or iron over design.